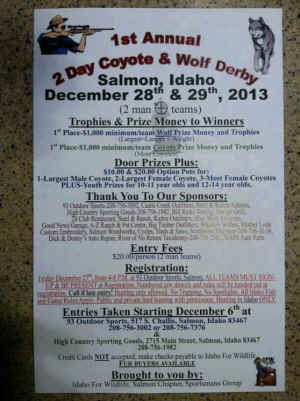 Stop the December 28-29 Salmod, Idaho Coyote and Wolf "Derby"
Predator derbies are a shame to this great nation. We made a mistake with Wolves before and now we are doing it again. Have we learned nothing from our past? Don't let a small minority decide the fate of America's wild predators. Please join Project Coyote in protest of an indefensible coyote and wolf killing "derby" ironically scheduled on the 40th anniversary of the passage of the Endangered Species Act, our nation's safety-net for wildlife, that brought wolves back from the brink of extinction. It is imperative that everyone speak out against this atrocity scheduled in just two weeks. Time is ctitical. IOGA represents all outfitters in the state of Idaho. If you use Idaho outfitters for white water rafting, camping, backcountry skiing - please mention this and urge IOGA to speak out against having their members participate in a predator killing contest. A wolf tag can be purchased for as little as $11.75, permitting each hunter to shoot 4 to 10 wolves (depending on region). 154 wolves have been killed in Idaho since hunting season opened on August 30th. Idaho is showing the nation what happens to wolves following the removal of federal protections under the Endangered Species Act. This is not hunting but a gratuitous massacre that is legal in Idaho and across the country. 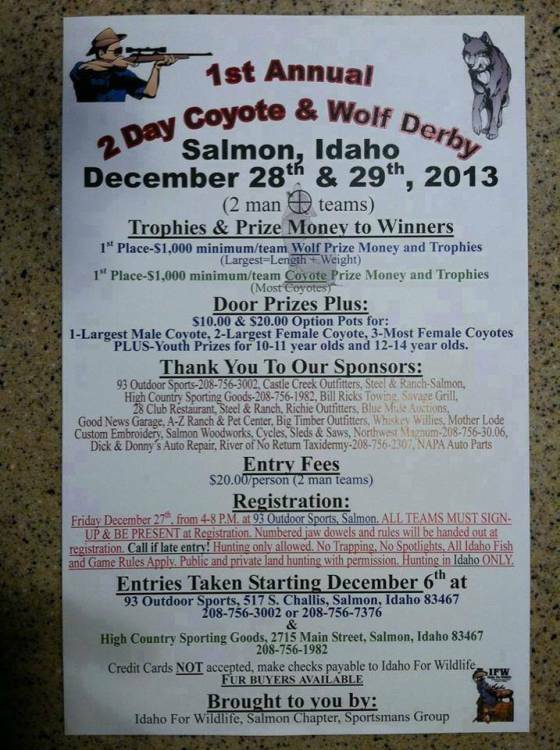 Prizes will be offered to contestants who kill the largest wolf and the most female coyotes. Children as young as 10 are encouraged to compete, with prizes being offered to youth from the ages of 10-14. These competitions are ethically indefensible and ecologically reckless, as well as a public safety risk, as shooters fan out across the landscape, trying to shoot large numbers of coyotes and wolves.